Do your search about the company as this is very important. Painstakingly find every thing out about the company, thorough research is important, know their product, values and current updates. Practice answering likely interview questions until the answers roll off your tongue effortlessly. Pick out a professional outfit to help you look the part. Be groomed and ensure that your shoes are polished. 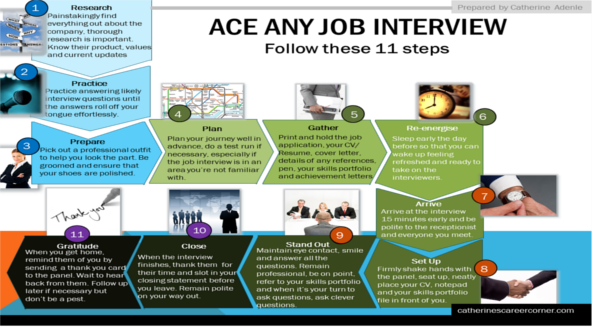 Plan your journey well in advance, do a test run if necessary, especially if the job interview is an area you are not familiar with. Print and hold the job application, your CV/ Resume, cover letter, details of any references, pen your skills portfolio and achievement letters. Sleep early the day before so that you can wake up feeling refreshed and ready to take on the interviewers. Arrive at the interview 15 minutes early and be polite to the receptionist and everyone you meet. Firmly shake hands with the panel, seat up, neatly place your CV, notepad and your skills portfolio file in front of you. Maintain eye contact, smile and answer all the questions. Remain professional, be on point, refer to your skills portfolio and when it’s your turn to ask questions, ask clever questions. When the interview finishes, thank the panel for their time and slot in your closing statement before you leave. Remain polite on your way out. When you get home, remained them of you by sending a thank you card or email to he panel. Wait to here from them. follow up later if necessary, but don’t over do it.